Viking Life-Saving Equipment Estonia is glad to invite members and friends of DECC to visit their premises in Peetri küla, just outside Tallinn on November 2 at 17:00-19:00. The company’s Estonian manager, Mr Jaanus Zovo (life-long captain, coach and consultant on life-saving on sea) shall introduce the company that was started in Denmark 1960 producing liferafts for fishing vessels, but is today a company represented in 45 locations with approx 1650 employees globally. Today Viking Life-Saving Equipment is a global market leader in maritime safety providing essential safety equipment for passenger and cargo vessels, offshore installations, defense and fire industries, fishing and yachting vessels. Viking Life-Saving Equipment Estonia operates in Estonia since 1996 making sure that our ferries, ships, boats would offer only safe journeys to their passengers. Welcome to take part of an unique visit to a completely different kind of a company! NB Please register for the visit latest October 31 by filling in the registration form click here for registration. Event is free of charge for everyone, but please note that the number of participants are limited. Please find the map to Viking Life-Saving Equipment Estonia by clicking here. VIKING is a market leader in maritime safety, providing and servicing essential safety equipment for passenger and commercial vessels, offshore installations and vessels, the defence sector, industrial fire fighting as well as leisure yachts.We are a private company headquartered in Denmark, with 1,400 employees worldwide. Products are manufactured in four locations: Esbjerg in Denmark, Bergen in Norway, Colorado in the US and Bangkok, Thailand. VIKING’s unique global network includes 54 branch offices and 270 certified servicing stations. 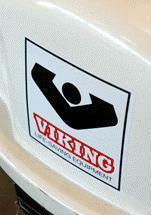 VIKING offers a choice of global safety solutions. Product portfolio includes: marine evacuation systems, offshore evacuation and crew transfer systems, liferafts, boats, lifesaving appliances, and protective clothing such as immersion suits, work suits, fire suits and lifejackets.